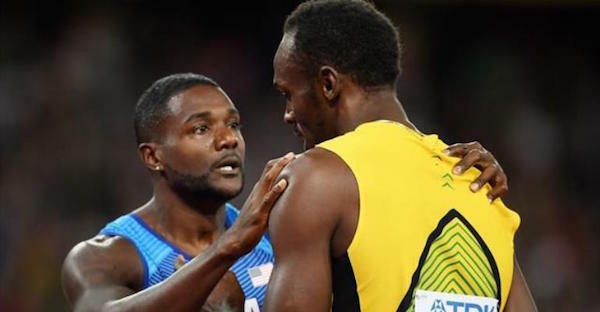 It was supposed to be Gatlin’s year in 2015, when the American went to the World Championships in Beijing on the back of a 28-race unbeaten run. Bolt produced his great miracle to beat him that night in the Bird’s Nest, but in the stadium where he won 100m Olympic gold in 2012, he could not provide the perfect ending to a perfect career. Gatlin, double Olympic champion in Athens in 2004, had been booed every time he went to his blocks at these championships, his doping past making him the cartoon villain of a troubled sport. He was to have his revenge in spectacular style, standing tall and putting a furious finger to his lips as his win stunned the capacity crowd. The crowd at the stadium took a little revenge of their own, chanting, “Usain Bolt! Usain Bolt!” as the result began to sink in.